What a treat we have in store today. The first Scottish recipe, fresh from my archive harvest. I suppose I'd best explain about all the shilling stuff, hadn't I? Back in the mists of time (the beginning of the 19th century) it wasn't uncommon for breweries in both England and Scotland to denote the strength of a particular beer by its wholesale price. Per hogshead (54 imperial gallons). By 1850, most English breweries had swapped to the X-system, where the relative strength was indicated by the number of X's. But in Scotland the system persists, to some extent, to the present day. Of themselves, names like 60/- and 70/- tell you nothing about the type of beer, just its relative strength. What I'm saying is: don't assume a 60/- Ale is automatically a Mild and a 70/- Ale a Bitter. Would you like to see details of Maclay's full range in 1909? Of course you do. It might help explain the shilling business. Note that there is both a Stout and a Mild called 54/-. The gravities are also intriguing. Many of the beers are very watery for the period. There appears to have been quite a bit of regional variation in strengths. In England and Wales, the average OG in 1910 was 1052.30. In Scotland, it was just 1048.48. Whereas in Ireland it was a whopping 1064.78 (remember, Guinness was over 1070 at the time). I've not come across any London beer that was below 1040. Yet a good proportion of Maclay's output was. The 42/- Mild and 42/- PI look more like post-WW II beers than Edwardian ones. Hope that's enough background. I contemplated mentioning the history of Maclay. But we don't want this post getting too long, do we? I'll save that for another day. Lets move a little north of our past exploits and head to Scotland. Where beer counts as beer and whiskey counts as beer. Things that are low in gravity, high in taste and can be drank in massive quantities . . . unless the Scotch comes out . . . which is always does. Personally I think the Scottish ales are some of the beers that people talk the most about but know jack crap about. After spending a good amount of time in Scotland their lighter beers are some of my very favorite session beers of all. Most don't tastes like these experts say they are supposed to. So here is your first 'traditional' Scottish ale. Its low in alcohol but quite high in hops. The first thing you'll notices is how little home grown malt they actually use. They mash tun is filled with grain from around the globe. Oregon, Tunisia and India to name a few. They use the traditional grits . . . yes, I'm saying these are traditional and equating them to flaked maize . . . also traditional. Its not really the fact to me that they use grits its that they treat them very much like the Americans of the same time with the side cereal mash. To boot they are nearly 21% of the grist! The amount of sugar they use is 12% which makes nearly 1/3 of this beers fermentables non-malt based. Amber malt. That's right. 2% amber malt. Seems to be the exact proportions that the experts deem that roasted barley was used. In all seriousness, there are VERY few Scottish ales I've seen brewed with roasted barley over ANY range of years. This amber, even at 2%, would definitely lend a toasty dryness. So here is the kicker. The color. 12 EBC (5SRM). That is very light for anything especially a 'traditional' Scottish ale. I poured over the logs to see if there was any indication of anything 'dark' added. Crystal, dark sugar, etc. They actually have a place in the logs for 'colouring' with a big strike through it. So it is what it is I guess. This sucker was a lot more pale than I would have imagined . . . but data doesn't lie, right? Nothing really fancy here. A straightforward high temp mash to get all those big dextrins into your beer . . . gonna need that with the amount of non-malt adjuncts. Also, its pretty wet for a single beer mash at 1.3qt/lb (2.7L/kg). The log actually has 6 different entries for hops. Some the same but different years. It basically boils down to two different types, UK Kentish and the Oregon Cluster. The 24bu are a decent amount so you definitely will be able to taste the hops in this one. Hmm . . . the more and more I look at this trucker the more and more it seems to be a traditional bitter! Tons of gypsum add along with a fair shake of Calcium chloride and magnesium sulfate. No notes yet. However I can tell you that there will be a lot of corny character but not to dry as it only ferments down to 1.013. I'm telling you this seems more like Fullers 1910 AK than what would thought to be a Scottish ale. My usual question: how did the nomenclature stick? The drayman hands over the invoice and the canny landlord, noticing the price hike, does a quick calculation and says "Hang about, pal: that 70/- works out at 73/6. What's the story?" It seems a very odd thing to base the name on. Have you any idea of the period for which the wholesale price of a hogshead of 80/- was 80/-? Beer Nut, that's a very good question. And one to which I have no answer. At the moment. Just had a quick look at the William Younger Gravity Book and there almost no mentions of shillings (it covers the period 1920 - 1933). There a a couple of weak 90/- PAs and that's about it. The Usher's Gravity Book, covering a similar period, has shillings all over the shop. But not fixed to any particular style. I need to investigate further. Very interesting recipe. It kind of throws the modern concept of Scottish ale on its head: high use of adjuncts and noticeably bitter (at least for the strength). It's interesting to see the 2% amber malt instead of the modern interpretation of 1% roast barley. Thanks for sharing this one. I may give it a shot this weekend. Wonderfully interesting stuff. Another "taken for granted as fact" concept shot to hell. LOL. I've learned more about some of my favorite beer types from this blog than from 30 years of reading beer literature. Amazing what has been written and accepted totally based on conjecture. Fact checking...what a concept! Can't wait to try out some of these new old Scottish Ale concepts! I think you do it just to annoy me. Bloody 6-row malt again. Here in the UK 6-row is pretty much spawn-of-the-Devil stuff and since Beaven introduced Plumage Archer 6-row has only been grown for animal feed. Previously Kristen has written about the need to use 6-row to reproduce these recipes fully. So, what should I substitute for the 6-row in order to get as close as possible to the original? 6-row is available from European maltsters but delivery costs are a problem. Maybe I will pick some up on my next road trip to Belgium :-) . So the reproductions of these recipes with ingredients that one can find is basically a 'best can do'. Meaning, get it as close as possible. If you don't have any 6-row then a malt two-row malt of 'lesser' quality would be fine. Nothing great like Maris Otter or Golden promise. A good bet is the cheapest malt you can get your hands on. 1. Maris Otter is King! It's quite hard to get any other pale malt. 3. And the cheapest? Maris Otter of course. Doh! I'd go with the pearl...never even see the Cocktail here though I haven't heard great things. My local maltster is trying to beg a 25kg sack of 6-row for me off of one of the big boys (amazing what people will do for beer ;-). If he has no success I will go with the pearl. I read on a malting company's website (think it was Munton's) that they only sell the highest grades of malt in the homebrew trade. Up to you to decide whether that's marketing talk or a deliberate decision to make inexperienced brewers' lives easier. 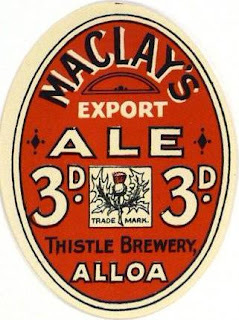 I just picked this up and OK it's 2018 so quite a long time ago but as a ex Scottish (now English) pub licensee and having bought lots of McClays as well as Beers from many Scottish breweries, here's the skinny.. The Shillings name came from how much duty/tax the brewer paid to the government on an eighteen gallon of beer and this was based on the alcohol strength of the contents. Light, pale Beers were often called BY THE BREWERS- 40 shillings, stronger bitters were often called 60 shillings,Stouts 80 shillings and the famous 'over strength'Barley Wines (usually 8% and above) 'Wee Heavy's' as they were traditionally drunk in 'nip'or third of a pint glasses. sorry, that just isn't true. The post-WW II shilling designations didn't refer to anything concrete and definitely not the tax paid. I've never come across a 40/- beer after WW I. 60/- wasn't a strong Bitter, but a weak Bitter of around 1030º. The shilling amount can't possibly refer to the tax for an 18 gallon barrel. Even in 1969, the tax on 18 gallons of beer at 1037º (about the strength of 70/-) was 122/-.